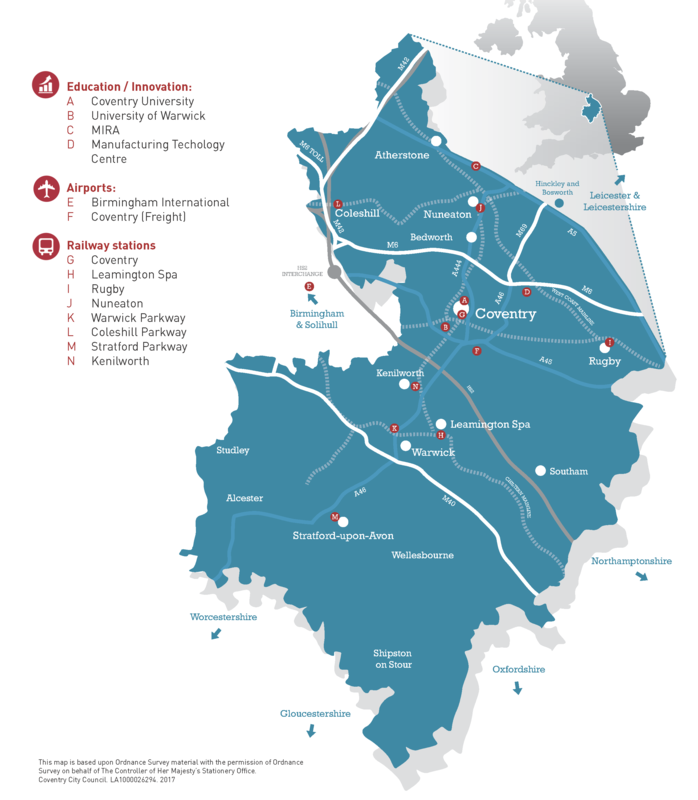 Situated in the centre of the UK, Coventry and Warwickshire is an enviable location for any business to be located. Being at the heart of Britain's transport network provides links to road and rail that the rest of the UK strives for. 75% of England is within a 2-hour drive time of Coventry and 6 million people within 1-hr drive time. Convenient motorway networks include the M6, M40, M42, M45 and M69 and close proximity to the M1 and M5. This network, along with the A14 and A5, provides access to all parts of the UK. 17 miles to Birmingham, 87 miles to London. Coventry is located on the Western mainline in the centre of England and is accessible by rail to London in only 59 mins, and in 20 mins to Birmingham. Given our location at the heart of the logistics ‘Golden Triangle’, and the number of important Advanced Manufacturing companies in the proximity, it’s not surprising that the area has excellent links to the UK rail freight infrastructure. ABP Hams Hall Rail Freight Terminal at Coleshill connects with the ports of Southampton, Felixstowe and Ipswich plus, via the Channel Tunnel, Novara in Italy and domestic intermodal services to Mossend - Glasgow. Birmingham Intermodal Freight Terminal (BIFT) located at Birch Coppice, receives seven Freight Trains daily from the UK ports of Felixstowe, Southampton, Tilbury and Thamesport. Daventry International Rail Terminal (DIRFT) next to Rugby is expanding with a third phase and will have the capacity to handle up to 32 trains per day. There are daily train services operated between DIRFT, Grangemouth, and Mossend providing a crucial link between ports, production facilities and distribution terminals. Birmingham Airport is 20 minutes or less by rail or road and currently serves more than 150 direct scheduled and charter routes and offers an additional 340 possible connections worldwide with 50 different airlines. This gives passengers a choice of over 450 direct or one-stop flights. The primary airport serving Coventry and offering daily flights to all European capitals, as well as services to the USA, the Far East, Middle East, Africa and Australia. East Midlands Airport is only 35 minutes away by road and provides further options for European destinations. Coventry Airport is part of Regional & City Airports, one of the leading owners and operators of regional airports in the UK, Coventry Airport is a dedicated general and private aviation airfield – part of RCA’s vision to support smaller regional airports and airfields to prosper through effective management and collaboration, enabling them to benefit from the economies of scale and sharing of best practice traditionally enjoyed by larger hub airports.